Since nothing is configured yet we’ll end up in an empty window. Click the Add button. Check the Enable DKIM signing button. You can check which headers will be signed, you can see the Selector that’s used by HES and you can change the wait time. This is the time it takes for HES to start signing messages, and the wait time starts as soon as HES notices the public key in DNS. The default value is 48 hours, but I’ve changed this to 24 hours (since the TTL for the inframan domain is only 10 minutes). Click the Add button to add the new DKIM configuration to HES and after a few moments it will appear in the DKIM overpage page. 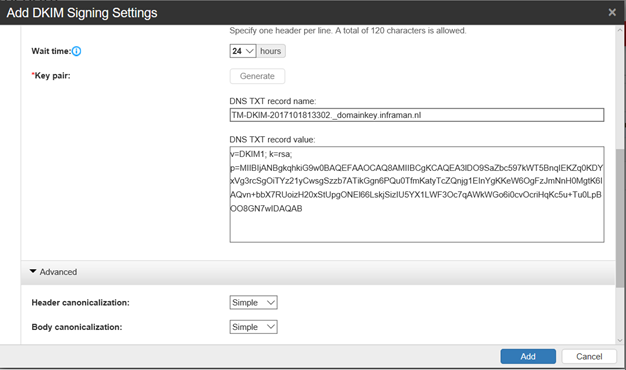 Its status will change to Active very rapidly, and so will the DNS Record status entry. 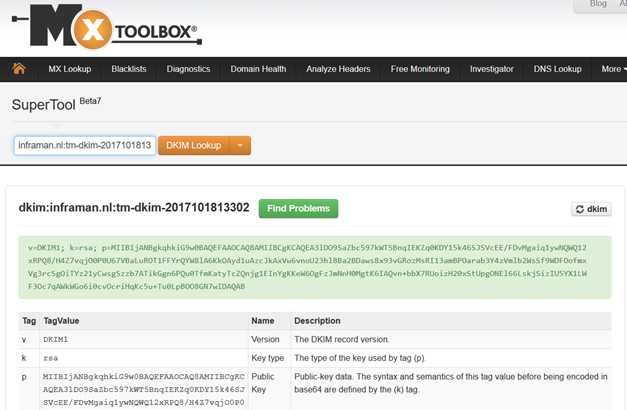 You can use the MXToolbox (http://mxtoolbox.com/dkim.aspx) to check if your DKIM record is ok. When using the MXToolbox tool make sure you use the proper Selector key. So, now we must wait (at least) for another 24 hours to see if all went well. So, when sending out email to my Gmail address and check the header information we can see the message is DKIM signed, and that verification of the message is successful. The last step is to enable DMARC. For outbound messages this is not a big issue since the verification for outbound email is performed by the recipient’s email server. 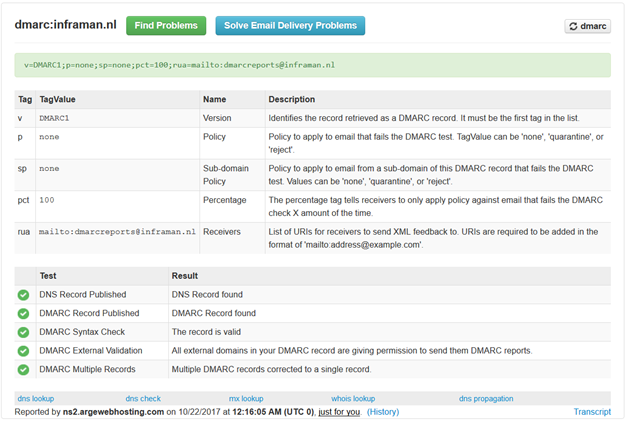 You only have to set a DMARC record in public DNS. In earlier blogpost I already explained the fundamentals of SPF, DKIM and DMARC. 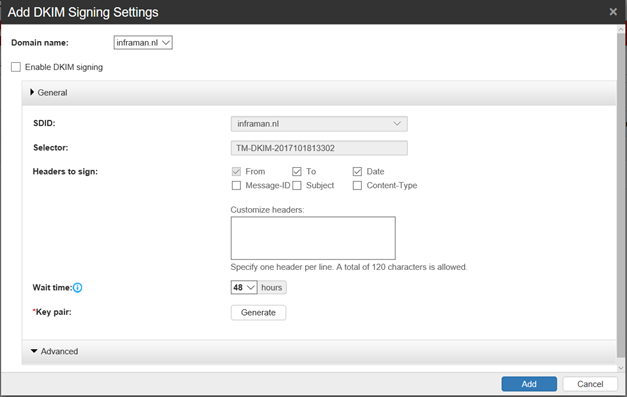 In the past two blog I showed you how to enable SPF, DKIM and DMARC (for my on-premises Exchange 2010 environment) for outbound email. DKIM signing is possible to perform on Exchange on-premises using a 3rd party solution like this on found on GitHub, but using an online solution like in my environment Hosted Email Security from Trend Micro gives you less maintenance and less complexity. Another advantage is the inbound DKIM and DMARC verification, which is the topic of my next blog.